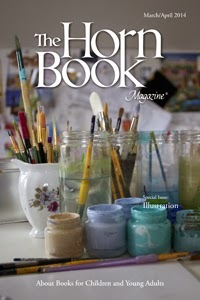 Yes, the May/June issue of The Horn Book is out. But I'm writing about the March/April issue, because I'm not comfortable being up-to-date. I'm talking about The HB's illustration issue. I didn't expect to enjoy it as much as I did. My interest in art is historical and cultural. I'm interested in what art says. How it's created is another thing, and I have little knowledge of technique. Less than little knowledge. Nonetheless, I found lots of good stuff in this particular issue, much of it written by illustrators. First off, I loved Leonard Marcus's An Interview with Neal Porter, probably because I love everything Marcus does. Porter is a founder of Roaring Brook Press, and the interview deals with picture books. Julie Danielson, of Seven Impossible Things Before Breakfast, has an article in which she introduces the idea of illustrators working with both "hand-crafted" and digital techniques. Gareth Hinds picked up on this thought in his Paint & Pixels. A number of illustrators wrote about how the way they work changes over time. Brian Selznik was influenced by an exhibit of another artist's work. Yuyi Morales's favorite medium is the one she's about to try next. And Gene Luen Yang moved on from How to Draw Comics the Marvel Way. Then Thom Barthelmess goes at illustration from another angle with What Makes a Good Book Cover? Even The Horn Book's From the Guide section deals with picture books, wordless picture books. Whew. Yes, there are reviews in this issue, too. Check them out when you get hold of the issue. Usually I pass my Horn Books on to a relative who is a middle school librarian. This one is going to one of the artists in the family.